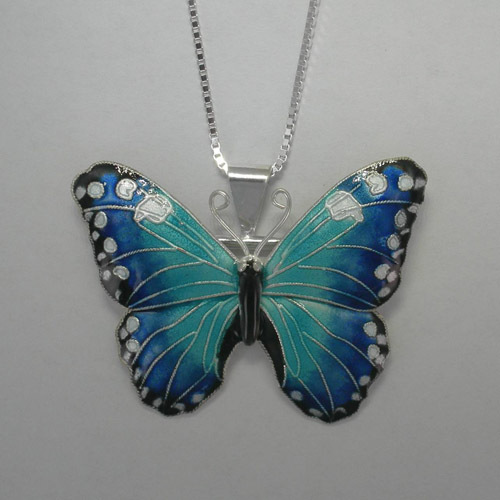 Desc: Sterling Silver Enamel Blue Morpho Butterfly necklace. The Sterling Silver chain is a box link and has a spring ring clasp. The pendant is fashioned to resemble a Blue Morpho butterfly. 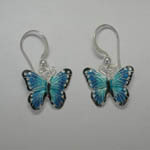 Different shades of blue and white and black enamel are mounted on the butterfly. The chain and pendant tube can be removed to wear the pendant as a brooch. The necklace has a bright polish finish. We have a matching pair of earrings, see SK1159.